1. Introduction; 2. Selected basic flows and forces; Part I. Collision of Liquid Jets and Drops with a Dry Solid Wall: 3. Jet impact onto a solid wall; 4. Drop impact onto a dry solid wall; 5. Drop impact onto dry surfaces with complex morphology; Part II. Drop Impacts onto Liquid Surfaces: 6. Drop impacts with liquid pools and layers; Part III. Spray Formation and Impact onto Surfaces: 7. Drop and spray diagnostics; 8. Atomization and spray formation; 9. Spray impact; Part IV. 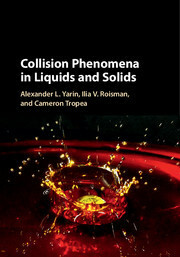 Collisions of Solid Bodies with Liquid: 10. Rigid body collision with liquid surface; 11. Particle impact onto wetted wall; Part V. Solid - Solid Collisions: 12. Particle and long bar impact onto a rigid wall; 13. Shaped-charge (Munroe) jets and projectile penetration; 14. Fragmentation. Alexander L. Yarin is a Distinguished Professor at the University of Illinois, Chicago, a Fellow of the American Physical Society, and a recipient of the Rashi Foundation Fellowship of the Israel Academy of Sciences and Humanities in 1992–5. His awards include the Gutwirth Award from the Technion-Israel Institute of Technology, the Hershel Rich Prize, and the Prize for Technological Development for Defense against Terror from the American Technion Society. Ilia Roisman is based at the Institute of Fluid Mechanics at Technische Universität, Darmstadt, Germany, where he leads the research group Dynamics of Drops and Sprays. He was the recipient of the STAB Research Prize for Fluid Mechanics in 2010. Cameron Tropea is Head of the Institute of Fluid Mechanics and Aerodynamics at Technische Universität, Darmstadt, Germany. He is a member of the Scientific Commission of the Council of Science and Humanities in Germany and has been Editor-in-Chief of Experiments in Fluids since 2002.